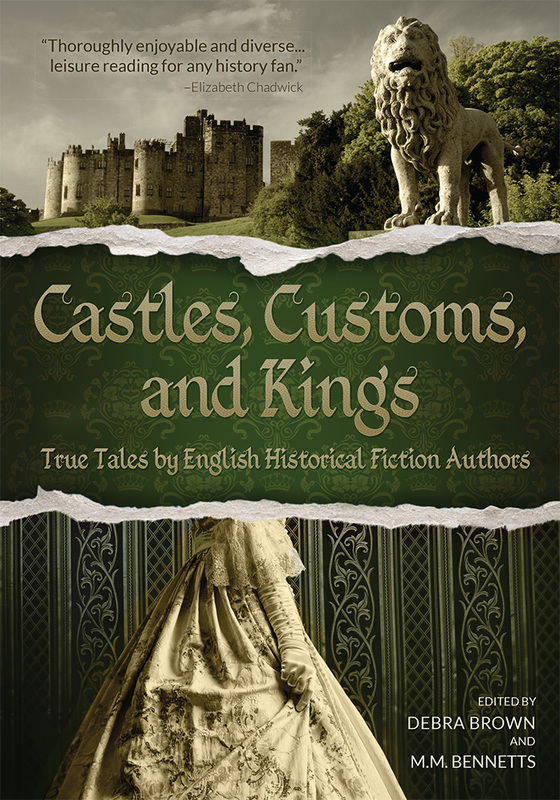 23rd September sees the publication of Castles, Customs and Kings – a collection of true tales by English historical fiction authors. My contribution to the book is Two Legends; Two Outlaws where I talk about Robin Hood and Sir William Bradshaw. There are lots of other gems in the book from some well-known historical authors so it’s well worth getting hold of a copy. It’s the sort of book you’ll keep on your shelf and refer back to time and again. 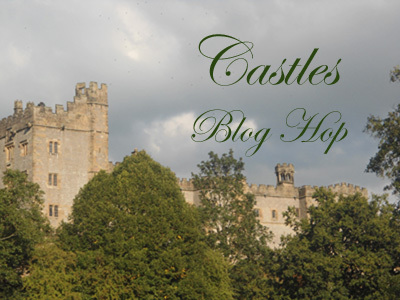 To celebrate publication day, the contributing authors are taking part in a blog-hop about castles. See the bottom of the post for the links to the other articles. My choice is Pontefract Castle. 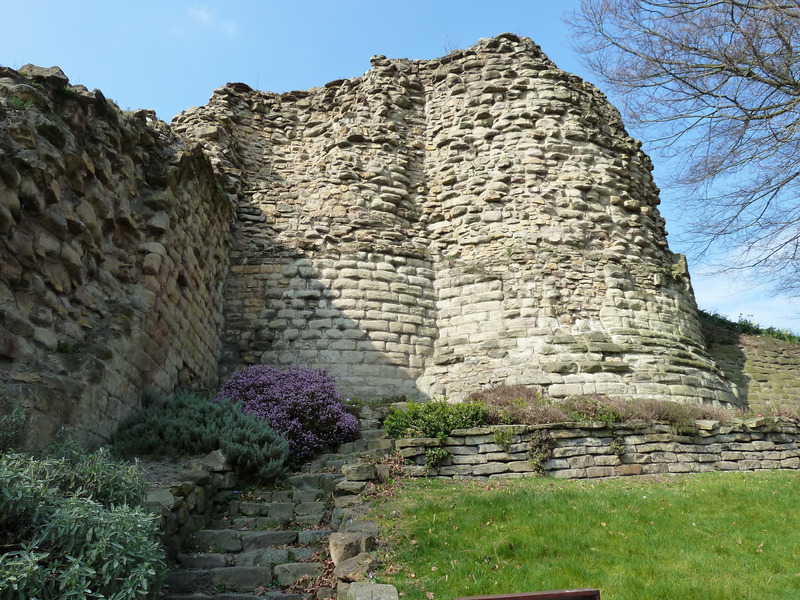 It isn’t as well-known as places like Warwick Castle and the Tower of London, which are better preserved, but at one time Pontefract was one of the most important castles in England. 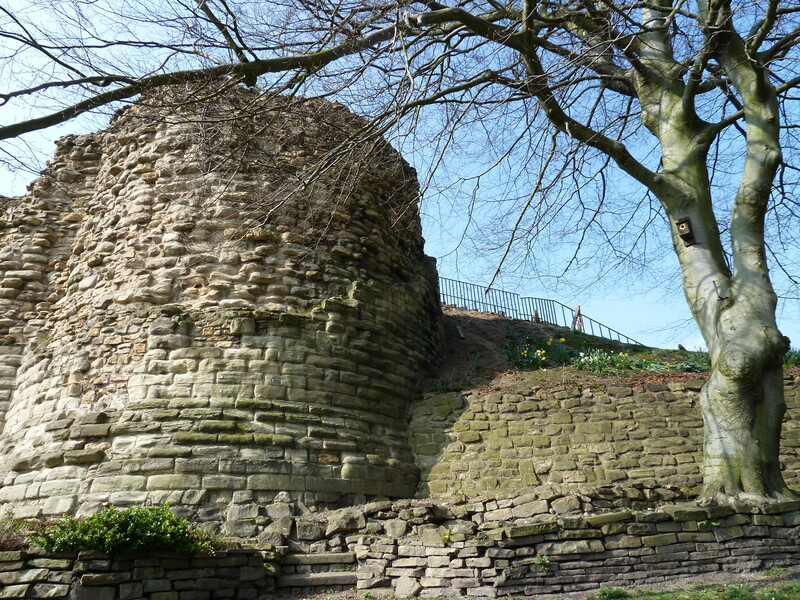 Like most English castles, Pontefract began as a timber castle on a mound surrounded by a bailey. That castle was built around 1069/70 by Ilbert de Lacy, who had accompanied William on his Norman Conquest. Ilbert’s reward was extensive lands in the north of England in what is now Yorkshire and east Lancashire. 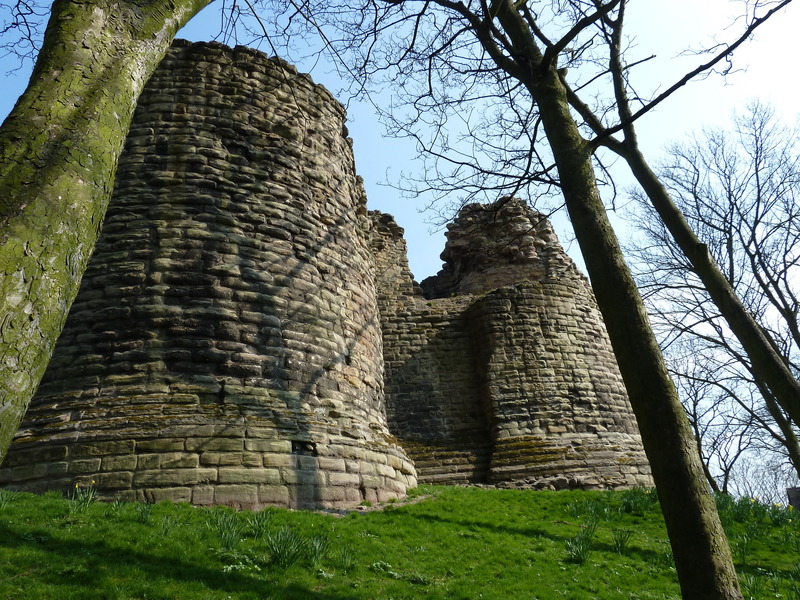 The first castles built after the Norman Conquest were mostly constructed from wood, brought in a type of medieval pre-pack form from Normandy, and local people were forced to help to construct them. But wood was prone to fire and to rotting in the damp English air, so over the next century the wooden structures were replaced with stone for greater strength and permanence. The impressive towers of the outer walls at Pontefract can still be seen, but there is little left within them and no sign of the great hall that would have been the central focus of life here in the middle ages. But you can see the remains of one of the earliest stone buildings within the castle, which was a chapel dedicated to St Clement. Parts of the towers and the kitchen block also remain, although it is possible that there are more remains below the grassy surface. The cellars which were cut from the bedrock beneath the bailey still remain. They were used as a magazine (military store) from medieval times until Civil War and on certain days they are open to the public and you can go down the steps to see where Civil War prisoners carved their names into the cell walls. The castle passed down through the de Lacy family. You can read more about them here. Pontefract Castle was later returned to the Earls of Lancaster and became part of the Duchy of Lancaster when it was created in 1351. The Dukes of Lancaster went on to become kings (and queens – the present Queen Elizabeth II is the Duke of Lancaster) of England when Henry Bolingbroke, the son of John of Gaunt, forced the abdication of his cousin Richard II, who died at Pontefract Castle after being starved to death. Major building work took place between 1399 and 1405 when the Swillington Tower was built and the king’s great kitchen. It was a huge and prestigious palace and what remains today can only hint at its past grandeur. Later, when the Yorkists came to the throne, Richard III, whilst he still the Duke of Gloucester, used Pontefract as one of his official residences and his illegitimate son, John of Pomfret is thought to have been born here. 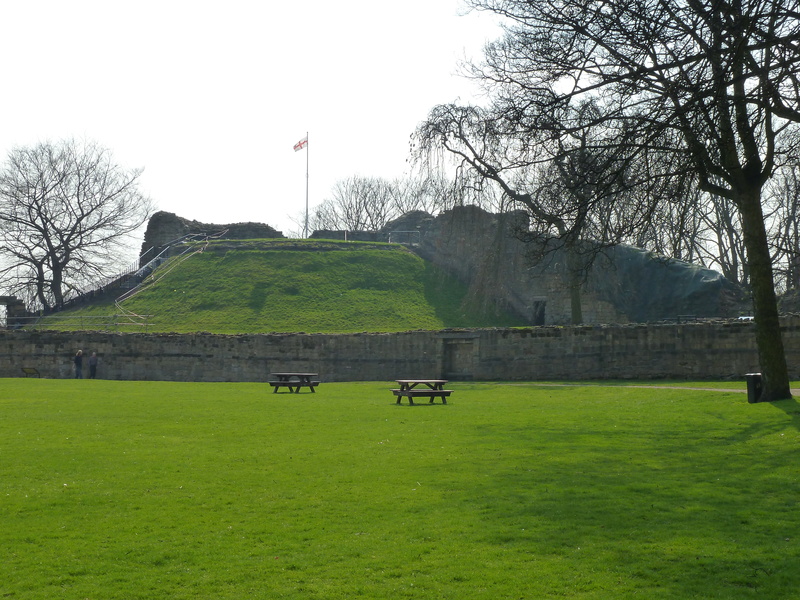 In 1483 when Richard took the throne he had three of his opponents executed at the castle, including Anthony, Earl Rivers, the uncle of the deposed Edward V.
During the Civil War, Pontefract Castle was held for the King. It withheld three sieges but was finally forced to surrender in 1649. Like many other castles, its destruction was ordered by Oliver Cromwell so that it could not be used a stronghold against him again. In later years the bailey was filled with soil and used to grow the liquorice for which Pontefract has become famous. 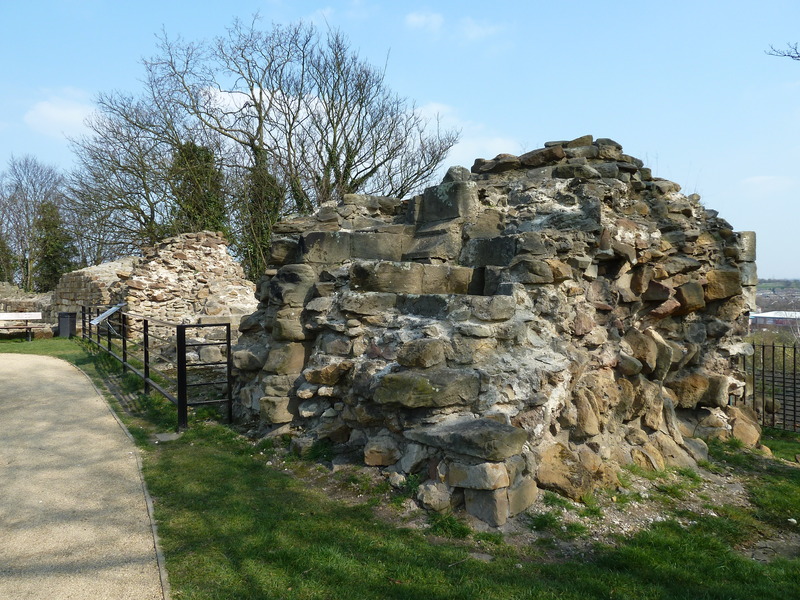 The castle is now a scheduled ancient monument in the guardianship of Wakefield Council, although it remains the property of Her Majesty the Queen as part of the Duchy of Lancaster. It is free to visit and an excellent visitor centre has recently been opened. 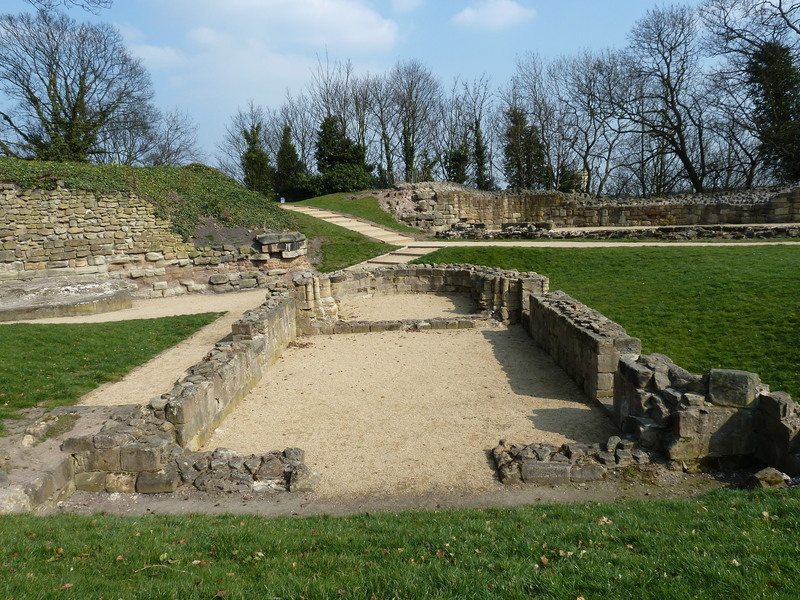 You can find the Pontefract Castle Facebook page here. that I will give away to one lucky reader! Leave your name in the comments and I will pick one at random and post the winner here on 31st October 2013. 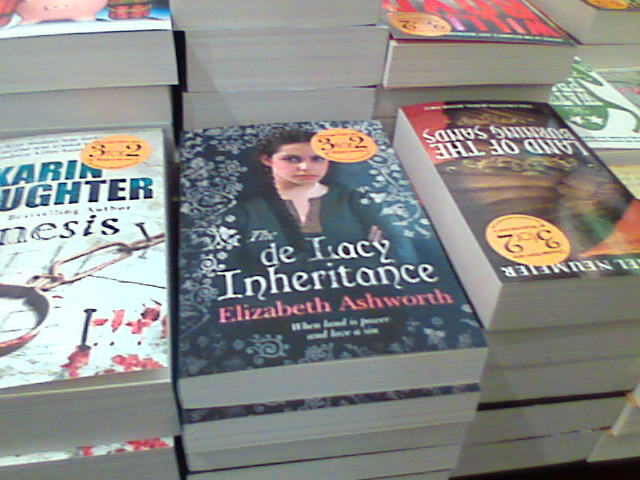 The winner of the paperback copy of The de Lacy Inheritance is: Helen Hollick! so thrilled i discovered you. i’m in US and quite the anglophile. been absorbed in White Queen and soooo glad to know of your works, deep research and authenticity. i ‘m hook and will follow follow follow. Thanks! I’m glad you found me. If you enjoy my books please recommend them to other readers as well. Thank you for the giveaway and your informative post. I didn’t know that Elizabeth II was the Duke of Lancaster. Wonderful post, I would love to read your book. Thanks for the giveaway. This was fascinating to me- I can’t get enough of these castles. And Pontefract has a very interesting past. Thanks so much for participating in the blog hop! what an interesting post! Thank you! Great post and I LOVE the castle pics! This was a great post! I learned lot more about the castle. Thank you for the article on Pontefract. Wonderfully informative. Thanks also for hosting the giveaway. I would love a chance for the novel. Thank you for the article on Pontefract. I would love to read the novel and thanks you for the giveaway. Thank you so much for the fascinating information about Pontefract Castle, as well as the giveaway! Next Should the remains of Richard III be taken home?